Formed inside an oyster in both freshwater and saltwater environments, pearls are one of the only gems made by a living organism. When a foreign substance passes into the oyster between the mantle and the shell, the mantle becomes irritated. In order to protect itself the organism coats this irritant with a substance called nacre, the same substance with which it builds its shell. Layers of nacre eventually form a pearl. While white pearls appear to be the most popular, they are produced in a variety of colours including pink, green, blue, grey and black. Black pearls are indigenous to the South Pacific. Known as the Queen of Gems, pearls are renowned for their iridescence, radiance and their natural beauty. They have been used as decorative items as far back as 5th century BC. The rarity of natural pearls meant that they were reserved for the rich and powerful. They were one of the first gems adorned by women and over time pearls became something of a status symbol personifying wisdom, power and wealth. Pearls conjure up images of some of the world’s most iconic female figures including Cleopatra. In order to prove that Egypt occupied a legacy and wealth that rendered it unconquerable, Cleopatra bet Mark Anthony that she could host the most expensive dinner in history. So she laid a table with bare plates and filled some glasses with wine. Removing one of her pearl earrings she allowed it to dissolve into her glass of wine and drank it, winning the wager. One gemmologist has estimated that the monetary value of Cleopatra’s pearl earring would be the equivalent of over $9 million today. Among Cleopatra’s fellow adorners of pearls are royals, Anne Boleyn – who wore a strand of pearls with a gold ‘B’ pendant around her neck – and Queen’s Elizabeth I and II of England. Other famous adorners of pearls include Elizabeth Taylor, Jacqueline Kennedy Onassis, Audrey Hepburn and Coco Chanel. In 1917, renowned French jeweller, Pierre Cartier began his business in his new headquarters on Fifth Avenue, New York. Remarkably, Cartier purchased the headquarters from Morton Freeman Plant with $100 in cash and his most valuable two-strand pearl necklace, admired by Plant's wife. Cartier had been assembling the natural pearl necklace over a number of years. During the 1910's and 1920's, pearl necklaces "commanded the same prices as the most expensive Rembrandts and similar works by Old Masters.” The two strands of fifty-five and seventy-three pearls were valued at one million dollars. This three strand pearl necklace was auctioned at New York Magnificent Jewels via Christie’s, “a popular showcase for the unique and the beautiful.” The necklace is comprised of 180 individual natural pearls. These pearls vary in size, ranging from 4.95 to 11.05 millimeters in diameter. They are exquisitely matched and graduated. The three strand necklace is completed with an ornate cabochon emerald and diamond clasp. This five strand natural pearl necklace was also sold by Christie’s in 2012. 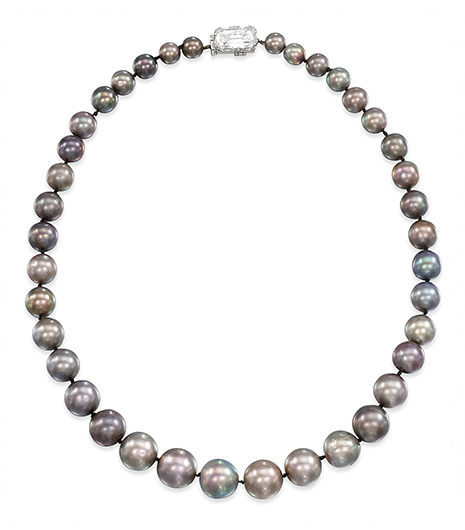 The innermost strand is comprised of sixty three graduated natural pearls. The next strand is comprised of sixty eight graduated natural pearls, followed by a strand of seventy two pearls. The fourth and fifth strands are both comprised of seventy three graduated natural pearls. The pearls range in size from 4.10 to 11.35 millimeters. The blue and gold silk cord that joins this necklace together makes a change from the usual diamond encrusted clasp, giving it an exotic touch. The rarity of natural grey pearls is reflected in the cost of this necklace. It is comprised of a single strand of thirty eight graduated grey pearls ranging in size from 11.4 to 6.8 millimeters and it measures 43.2 centimeters in length. It has a rectangular mixed cut diamond clasp, which adds to the striking beauty and elegance of the necklace. These pearls were auctioned off by Christie’s in 2002 for $3 million. They belonged to a collection of the late Lady Pearson, later Viscountess Cowdray. Often referred to as the ‘Pearl of Allah’, this pearl is reported to be the largest natural pearl in existence. 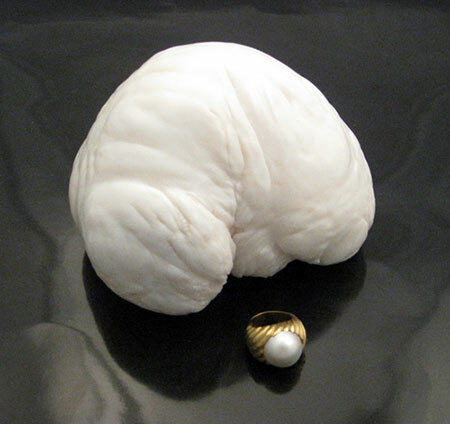 This unique baroque shaped pearl was discovered in the waters off the Philippines in the 1930's. Measuring 24 centimeters in diameter and 9.45 inches in length, the pearl weighs just over 14 pounds. Despite its unappealing shape and its lack of lustre, the pearl is valued at an expensive $3.5 million. This double strand pearl necklace is comprised of 120 individual pearls. They are quite large in size, ranging from 6.50 to 12.25 millimeters in diameter. There are variations in the coloration of these pearls, ranging from white to a very light cream colour. The pearls are imbued with subtle rosé and green overtones. The luxurious three carat diamond clasp joining this double strand necklace together is signed by Cartier. In 2012, this necklace was sold by Christie’s for the grand sum of $3.7 million. This is a natural abalone pearl which was discovered by diver, Wesley Rankin in 1990. The baroque shaped pearl is notable for its size, weighing 470 carats. It is iridescent pink in colour. Abalone pearls are unique in that their nacre is multihued in tones of silver, orange, pink, green, blue and lavender. In 1991, the ‘big pink pearl’ was valued at $4.7 million. It is still in the possession of Rankin who is known as the largest abalone pearl dealer in the world. He is the owner of the company "Pacific Coast Pearls" based in Petaluma, California. This two strand Baroda pearl necklace is rich in history. It is made up of sixty eight pearls selected from the fourth, fifth, sixth and seventh rows of an original seven-strand necklace, owned by the Maharajas of India. The seven strand natural pearl necklace was known as saath lahda. Each pearl is perfectly matched in colour, size and shape. The pearls are particularly large, ranging from 10 to 16 millimeters in diameter. The necklace is joined together by a cushion-cut diamond clasp signed by Cartier. It was sold in 2007 for $7.1 million. In Spanish, “la peregrina” means “the pilgrim”. This was once known once as the Phillip II pearl and it was the most celebrated pearl of its time. In addition to its great size, its perfect pear shape and bright white coloration boost the pearl’s value. The necklace is comprised of equally spaced floral patterns each of which has a ruby as its centerpiece. These are surrounded by diamonds in a floral pattern. In 1969, La Peregrina was purchased for a mere $37,000 by actor Richard Burton as a gift for his wife, Elizabeth Taylor. It was sold by Christie’s in 2011 for $11.8 million. In 2010, a very rare and expensive pearl was unveiled in China. The ‘Beauty of Ocean’ pearl weighs six tonnes and is five feet high. It is the biggest manmade pearl in the world. Composed of fluorite, this gem was ground into a pearl shape over the course of three years. The green pearl has a tendency to glow in the dark. Discovered in Mongolia, this rare and precious pearl is valued at a staggering price of $139 million. It is the most expensive pearl on the market.